Also ”If anyone recites Dukhan on the night of Friday then he is forgiven.” and "Whoever will recite Surah Dukhan on the eve of Friday, by morning he is forgiven and he will be wed to a Huri (damsel of paradise) with wide lovely eyes." Also Whoever recites Surah Dukhan on the eve of Friday or on Friday daytime Allah Ta’ala makes for him a home in paradise." Another shorter way from any a few verses for 70,000 angels seek forgiveness. 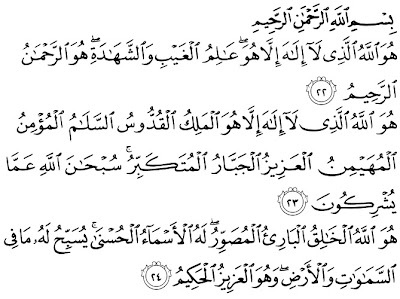 And thereafter the last 3 ayah of (59:22-24)-Surah Al-Hashr-(once). 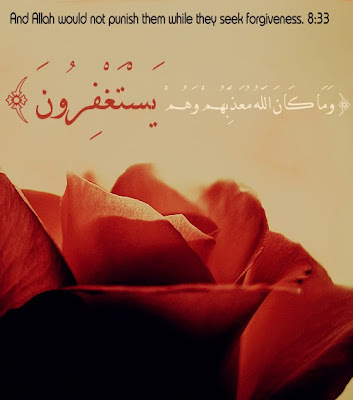 Bismillaah ar-Rahman ar-Raheem. Huwa-llahul-ladhi la ilaha ilia Hu. 'Alimul-ghaybi wa shahada, Huwar-Rahmanur-Rahim. Huwallahul-ladhi la ilaha ila. Huwal-Malikul-Quddusus-Salamul-Mu'minul-Muhayminul-'Azizul-Jabbarul-Mutakabbir.Subhana-llahi'amma yushrikun. Huwa-llahul-Khaliqul-Bari'ul-Musawwir, lahul-asma'ul-husna. Yusabihu lahu ma fis-samawati wal-ard, wa Huwal-'Azizul-Hakim. He is Allah, than whom there is no other God, the Knower of the invisible and the visible. He is the Beneficent, the Merciful.He is Allah, than whom there is no other God, the Sovereign Lord the Holy One, Peace, the Keeper of Faith, the Guardian, the Majestic, the Compeller, the Superb. Glorified be Allah from all that they ascribe as partner (unto Him).He is Allah, the Creator, the Evolver, the Bestower of Forms-the Fashioner. His are the most beautiful names. All that is in the heavens and the earth glorifieth Him, and He is the Mighty, the Wise. Then 70,000 Angels are appointed by Allah, who seek forgiveness on behalf of that person till the evening. Should he die during the day, he will die as a Shahid (martyr). You must have a wird (any repeated devotional act), of the Mighty Book to be read every day. The least you should do is read one juz' (one thirtieth of the Qur' an), so that you complete it once month, and the most is to complete to every three days. Know that great merit attaches to reciting the Qur' an, and an influence in illuminating the heart. The Messenger of Allah, may blessings and peace be upon him, has said : "The best of my nation's devotions is the recitation of the Qur'an". And Ali may Allah ennoble hid face, has said:" The one who recites the Qur'an while standing in prayer receives one hundred rewards for each letter; the one who recites it outside the prayer but in a state of ritual purity receives twenty-five rewards for each letter; and the one who recites it without ritual purity receives ten rewards for each letter." Beware of concentrating, while reciting, on reciting a large amount to the exclusion of reflection and correct recitation. You must reflect and comprehend while you recite; slow, melodious recitation will assist you in this. Feel in your heart the Magnitude of the Speaker (Transcendent and Exalted is He!) and that you are before Him, reciting His Book to Him, in which He addresses His commands, prohibitions, counsels and exhortations to you. When reading verses on unification and glorification be full of reverence and awe, when reading verses of promises and threats be full of hopeful expectation and apprehension, and when reading the commands and prohibitions be thankful, acknowledge your shortcomings, ask for forgiveness and determine to show ardour. Know that the Qur' an is the ocean where from the jewels of knowledge and the treasures of understanding are extracted. Any believer who is grant the way to understand it, his Opening (fath; Victory in a general sense. The same word can be used for the conquest of a city, the dispelling of hardships, achievement of success in any endeavour, and the unveiling of the Eye of the heart so that it begins to perceive the Unseen; it is usually in this latter sense that the term is used in sufi texts), becomes permanent, his light complete, his knowledge vast, and he never tires of reading it night and day, for he found therein his goal and his purpose. This is the quality of the sincere seeker. Shaykh Abu Madyan, may Allah me pleased with him, has said: " A seeker is not a seeker until he is able to find in the Qur' an everything that he desires." 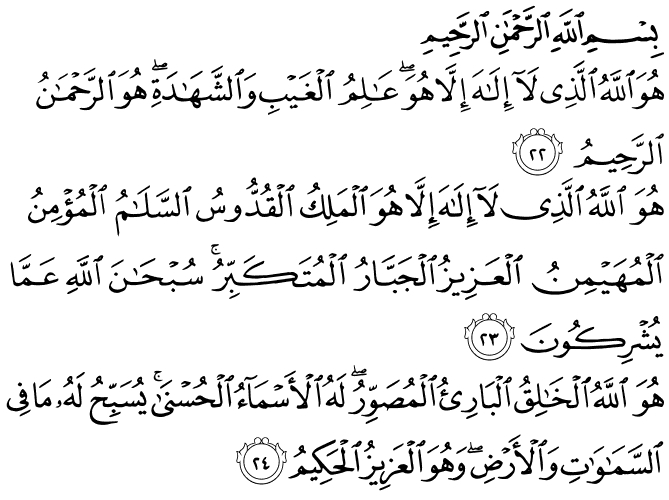 and the last two verses of al-Baqara; the Heifer, every night before going to sleep. al-Kahf; The Cave , on Thursday night and Friday. al-Mulk , And Insan; Man.for their merit is great. similarly, al-Ikhlas and he last two suras of the Qur' an together with the al-Kursi verse; The Foot stool [2:255], and suratal-Kafirun;The Disbelieves, immediately before going to sleep, making these the last thing that you utter. And Allah Ta’ala says the truth, and He guides to the way. jazakallah khair for this reminder. May it be a sadaqa jariah for you.